Jesse Vasquez Lara obituary. Carnes Funeral Home. 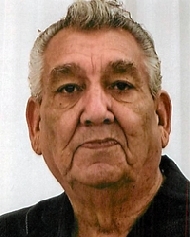 Jesse Vasquez Lara, 77, passed away Sunday, February 7, 2016 at his son’s residence in Texas City, Texas. He was born September 27, 1938 in Sugarland, TX. Jesse is an Army Veteran and retired residential painter. He liked to relax at Little Doggie with is partner of many years Elaine Clayton of Texas City, TX. He enjoyed traveling and spending time with family and friends. He will be remembered for his strength, sense of humor, his care for others, and being the best dad. Jesse is preceded in death by wife, Dimple Lara; mother, Jesusa Lara; father, Edwardo Lara; brother, Michael Lara; sisters, Angelita Lara Rodriguez and Cecila (Tila) Lara Cadriel. He is survived by son, Chris Hardy (Heather); grandsons, Macaeden and Brycen of Texas City, TX; brother, Raymond Lara (Goldie) of Katy, TX; sisters, Lenora Garcia of Hitchcock, TX, Esperanza Gonzalez of Houston, TX, Gloria Lara of Santa Fe, TX, as well as many family members and friends. A Celebration of Life in honor of Jesse will be held at a later date to respect his last wishes. Please visit Jesse’s webpage at carnesfuneralhome.com for additional services information.